Tour fare: Tax included, Japanese yen. Tour operation time : 09:00A.M. – Approx. 7:00-9:00P.M. Please read the remarks stated below and the tour conditions. Tour disbands at Tokyo Station. Tour operation time : 09:00A.M. – Approx. 6:00-8:00P.M. Recommended to JR Pass Holders! Tour disbands at Odawara Station. Tour operation time : 09:00A.M. – Approx. 5:00-7:30P.M. Tour starts in Shimbashi at 9:00A.M. Motorcoach ride will take approx. 150 minutes. Have approx. 30-minute boat ride. Tour disbands at Tokyo Station. Tour guide will inform you how to go back to your hotel before boarding the train. 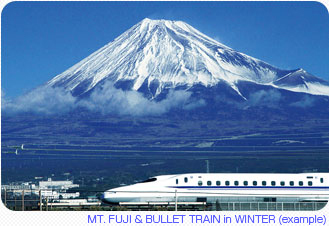 Non-reserved tourist class seats are used on Bullet Train (Shinkansen) . The tour disbands upon arrival at Odawara Station. The itinerary (tour completion time, visiting time, schedule, and others) may be changed due to heavy traffic, weather conditions, or other operational reasons. Even under these circumstances, the tours may not be canceled and the tour fare refund shall not be refunded. 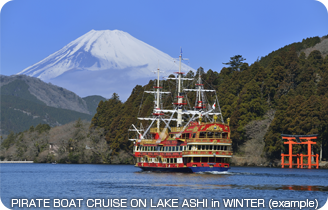 Hakone Sky Gondola, Owakudani Valley or Pirate Boat Cruise on Lake Ashi may be omitted or substituted due to weather conditions, heavy traffic, or other operational reasons. In such cases, a tour guide shall take you to one or two locations from among the following alternative sightseeing spots. Please note, however that the tours may not be canceled and the tour fare shall not be refunded. Alternative sightseeing spots; Hakone Komagatake Ropeway, Mt. Komagatake, Hakone Ashinoko (Lake Ashi) Boat Cruise, Hakone Shrine, Hakone Check Point, Hakone GeoMuseum, Narukawa Museum in Hakone, Boat Cruise on Lake Kawaguchi or Kawaguchi Ropeway. The tour guide shall finalize the best alternative under the circumstance. In some cases, a taxi may be used for pick-up & retutrn services. Due to operational reasons, a tour guide may not accompany you when providing pick-up & return services. You will drive up to the highest possible point when the road up to Mt.Fuji 5th station is closed due to snow or other reasons, if heavy traffic is expected or the tour is running late. Even under these circumstances, the tours may not be canceled and the tour fare shall not be refunded. 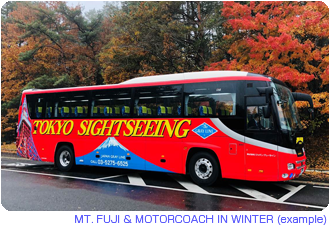 Even if Mt.Fuji and others are invisible due to the weather conditions, the tours may not be canceled and the tour fare shall not be refunded. For those with food allergies etc., we cannot provide any special meals. In that case, please choose the tour without lunch. Children up to 5 years old may join the tour for free, however, bus seats and lunch will not be provided. If bus seats or lunch is needed, the child fare is applied. 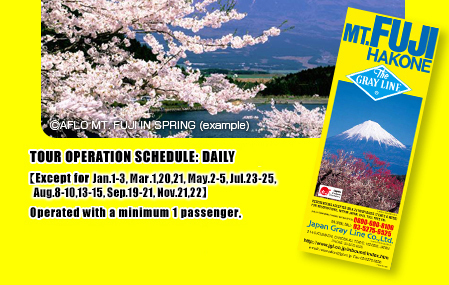 As a general rule, a tour guide will accompany you on the tour bus back to Tokyo after Odawara station. In this case, the tour guide will not board the Bullet Train (Shinkansen) between Odawara and Tokyo to accompany you due to operational reasons. The tour guide will inform those who are returning to Tokyo by Bullet Train how to go back to your hotel from Tokyo station before boarding the train. In case those participants who drop off at Odawara Station after the tour are late for their scheduled train due to heavy traffic or operational reasons, there are no refunds. We recommend you to bring warm clothing during autumn and winter.